Though your day job may feel like it eats up all of your time, the numbers don’t lie: If you spend eight hours per day at work, you still have eight hours to sleep and another eight to do whatever you please. That idea – eight for your employer, eight for sleep, and eight for recreation – was one of the most basic demands from labor unions in the early 1800s. Sure, the 40-hour workweek has come under criticism since then, especially considering many workers put in way more than 40 hours, but it also remains the theoretical standard. Which means if you’ve got a big idea or an itch to do some freelance work, you’ve got to maximize those other 40 hours (because yes, you technically have as many hours to do your own thing as you do to go to work) to the best of your ability. 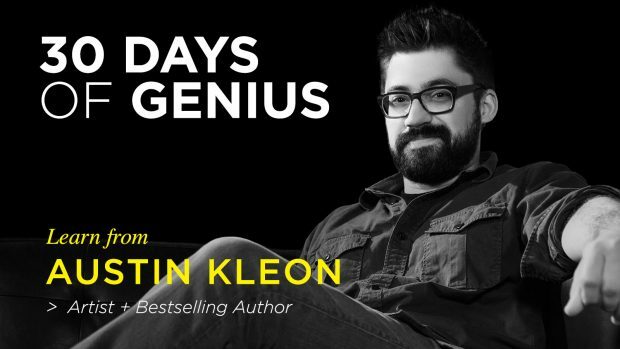 Watch our interview with Austin Kleon, successful artist and bestselling author, as he shares about his own personal journey building his side project and launching into a self-employed career on 30 Days of Genius. Getting up to something outside of work is definitely possible; data from the U.K. suggests that as many as 1/3 of workers have some kind of side-project or freelance gig outside of their regular working hours. The secret is figuring out how and when. And indeed, that’s one of the biggest questions creative people often have for those who have gone before them and been successful – how do you find the time? The reality is, the time is there. It’s just a matter of prioritizing it and setting it aside. Let’s do the math. Assuming you have a very regular 9-to-5 job (and plenty of people don’t, but let’s assume they do for the sake of simplicity), in addition to the eight hours per day you have to recreate during the work week, you’ve also got as many as 16 hours each day on the weekends. Subtract out important time uses like chores, parenting duties, social interactions, and exercise, as well as less-important-but-necessary things like time stuck in transit or time spent waiting on other people, and you’re probably looking at many fewer, probably spread out over several days. The key, then, is to lump them together. Prioritizing your time by budgeting it is one of the biggest steps you can take toward running a successful side project, because it provides you with what’s truthfully your most necessary (and precious) material. Often, side projects are the first thing to fall by the wayside when the rest of life gets hectic – which is why it’s important to really invest in them by setting aside time. Rather than waiting for creativity or inspiration to strike, set yourself a time each week when you have a moment to just work on your thing. Make that time a non-negotiable. Whether it’s the time you spend answering emails, engaging on social media with your audience, uploading new photos to your Etsy store, or editing the pictures from your last shoot, that time that you’ve set aside – even just once a week – will become something you look forward to, and something that’s worth prioritizing. 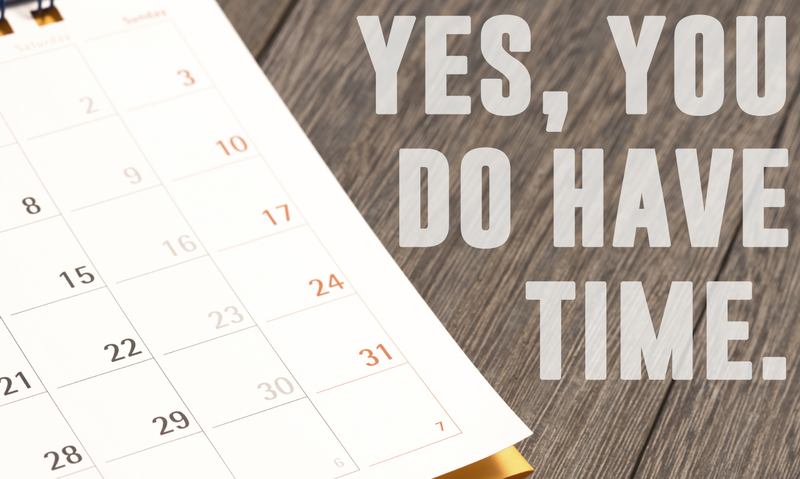 And if you’re having trouble finding any time to set aside? It may be a matter of having too messy a calendar, or not factoring in uncontrollable elements. You might also be trying to juggle too much, which will ultimately end in balls being dropped. Try to tighten up your schedule (here are some tips for how to make more time each day, including getting up earlier and reducing your overall transit time), and empower yourself to drop commitments that don’t offer you anything. Another good way to make time for side projects is to figure out what you can double up on. Do you find that you have a lot of time on your hands while, say, waiting in traffic? If you drive alone in your car, consider recording your thoughts into your phone. Hold a one-person meeting or brainstorm session in your car, or make a list of everything you want to achieve over the weekend. Clear out some space in your brain by making lists out loud. If you commute by bus (or another way where talking to yourself might be sub-optimal), make lists the old-fashioned way. Use your idle time to come up with ideas, generate action plans, or just set out a clear list of intentions. That way, when you do have the time to sit, you’ll be prepared with an exact recipe for how to spend it. You can also maximize your time by using your free time as a moment to learn or find inspiration. Stream podcasts while you walk the dog to come up with new ideas. Hold conference calls over your lunch break in a quiet place at the office. Catch up on emails during your coffee break. Any time you’re doing something that doesn’t take up your full attention, consider where or not there’s another thing you can bang out quickly, too. 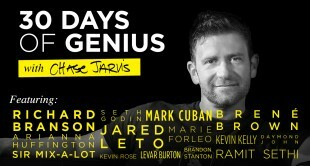 Watch more with Austin Kleon as he shares about his own personal journey building his side project and launching into a self-employed career, in his hour-long interview on 30 Days of Genius. Nights and weekends are all well and good, but occasionally, your side projects might need to take you away from work on a lunch meeting or afternoon client session. For those situations, it’s worth speaking to your employer about your side projects, because it may behoove them, as well. Creative side projects not only make people better workers, they also, as author and artist Austin Kleon explained to Chase Jarvis, make their employers look good. Your side project might never become your full-time job – and that’s fine; some of the best side gigs come out of genuine curiously and hunger for something creative, not financial or commercial need – but even if that’s the case, you want to treat it with the same measurement of seriousness and interest that you do any paid or commercial work. Just because a side project exists outside of work doesn’t mean it’s not important or not worth really investing in. Treat your side project with care and consideration, and assume that even if it never becomes your professional mainstay that it could be your next big thing. If whatever you’re working on is important to you, the time is there. You just have to find it, set it aside, and treat it respectfully.